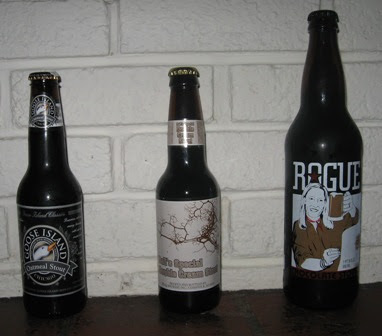 Tonight we are comparing three stout beers: Rogue Chocolate Stout (Oregon), Bell's Special Double Cream Stout (Michigan), and Goose Island Oatmeal Stout (Illinois). Why these three? They were the only stouts available tonight at the unusually understocked Pace Hi, our nearest fine beer carryout. First Impressions (head, aroma, and color) Rogue: Clean chocolate smell. Not much hop on the nose. Dark, near black color. Foamiest head. Bell's: Slightly chocolate, dark malt nose. Dark brown, cloudy color. Foamy head that remains throughout the drink. Goose Island: Malty, medium hopped nose. Black, clear color. Least head that quickly dissipated. The Drink (taste and palate) Rogue: Strong chocolate and heavy malt flavors with a heavy hop finish. Medium carbonation and light mouth feel. The chocolate was so strong that I asked "Does this have flavoring?" After digging the bottle out of the recycle, we found the ingredients list, including 'natural chocolate flavor'. Over the whole of the beer, the chocolate became overwhelming. Bell's: Well balanced, mellowed malt and hop flavors. Low carbonation and smooth, easy drinking mouth feel. Like other Bell's beers we've tasted, this one is hard to complain about. Well balanced seems to be the name of their game. Goose Island: Malty, low hop flavor. Low carbonation and rich creamy mouth feel. (Oatmeal provides this mouth feel every time.) Nice, non-challenging easy to drink stout. Overall We will not buy the Rogue Chocolate Stout again, instead dreaming of January 1, 2009 when we allow ourselves another purple and orange beauty: Young's Double Chocolate Stout (brewed in the UK). We will choose the Goose Island when we are introducing someone to stout, or want something non-confrontational. It would pair wonderfully with a rich stew or meat dinner. The Bell's was lovely. We will certainly buy the double cream stout when looking for a sweet smooth stout to pair with a dessert or for a special occasion. Small Business Contest - please vote!